Young children love creating things. Nothing keeps them busy like tackling a fun art project, but crafts can be great teaching tools too. So pull out the glue, scissors and paper, and let your preschoolers express their creativity while you sneak in a little math and reading with these bear-themed crafts. Preschool children will work together to create a mural that retells the movement song, “Going on a Bear Hunt” and provides reading practice, too. Begin by singing the bear hunt song or readingWe’re Going on a Bear Hunt by Michael Rosen with the class. Afterwards ask the children to think back to the beginning of the song and list all of the things you encountered on your bear hunt; tall grass, gooey mud, etc. Make a list on chart paper. Explain to the students that you are going to work together to make a mural or giant poster that retells your bear hunt. Look at the list you made and assign pairs of children to make the different items on it. A few students might work on making grass, while others make mud, the tall tree, the dark cave and anything else found in the version that your class is familiar with. If you have a lot of students, some children can work on making the sun, clouds, birds and more to add to the mural. Give each pair of children colored paper, markers, crayons and scissors to use to make their part of the mural. Keep in mind that younger children may need help with some of the cutting. This would be a great day to invite a parent volunteer or two to help out. Once all the individual parts are made, gather the children around a large sheet of white bulletin board paper. Have them help you place the items on the paper to retell the song and then glue them on. Next, work with the children to add some labels to your mural. (You might save this for the following day.) Hang the mural in the classroom. If you don’t have an empty space in your classroom, maybe you can hang it in the hallway right outside your door. Have the children sit on the floor close to the mural so that they can all see. Tell them that you are going to write the names of the pictures they made and add them to the mural. Make the labels on index cards or sentence strips and add them. 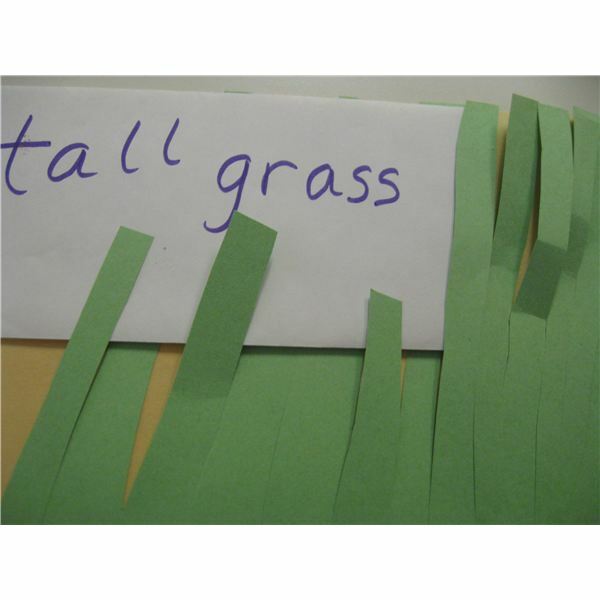 Use the language from the song, like “tall grass.” As you write encourage the children to help you spell the words. Ask, “What sound do you say at the beginning of the word tall? What letter makes that sound?” Even just focusing on the beginning sounds will help the children find and read the words later on. Once the labels are added, you can use it as a language arts center. Place some pointers near it and the children can use it to help them sing the song or they can use the pointer to point to the labels and practice reading the words. Use this craft as a literature connection after reading a book about a bear, like Corduroy by Don Freeman or Old Bear by Kevin Henkes. Children will work on fine motor skills and counting while creating a puppet they can use to retell a story. Before you do the craft, cut one bear shape out of card stock for each child. Dye the cotton balls brown by placing them in a plastic zipper-locking bag with some cocoa powder. Shake them until the powder has coated all of the cotton balls. You can also leave them white if you want to make polar bears instead. Place a bowl of the brown cotton balls in the center of each table. Give each child a bear shape, glue and a pair of plastic tweezers. Show them how to put glue on a small part of the bear and then use the tweezers to count out five or six cotton balls and put them in their work area. They can then fluff out the cotton balls and glue them onto the bear. Have them continue to add glue and count out cotton balls, until the whole bear is covered in cotton. Then give them wiggly eyes, a small circle of black paper and a red pipe cleaner to add to the face to make eyes, a nose and the mouth. To make it a puppet, glue a craft stick to the bottom. 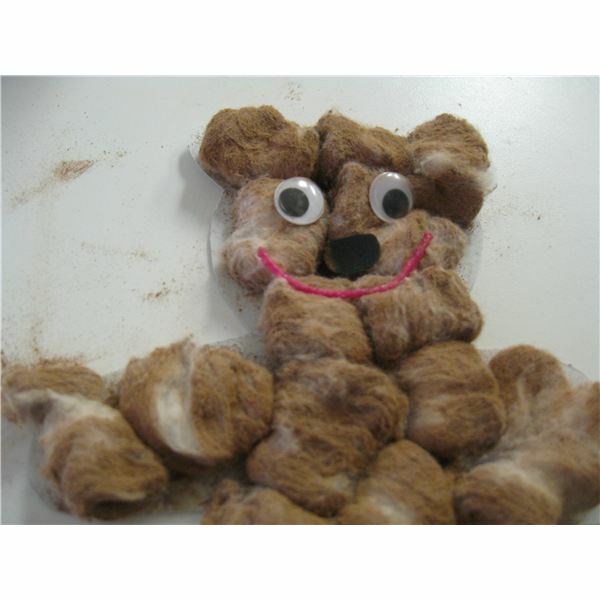 Since preschoolers love to do arts and crafts, they will have lots of fun making these early childhood bear crafts when you study bears or any time of the year.